A fridge is not just a fridge. You should demand more and insist on a high standard of performance. 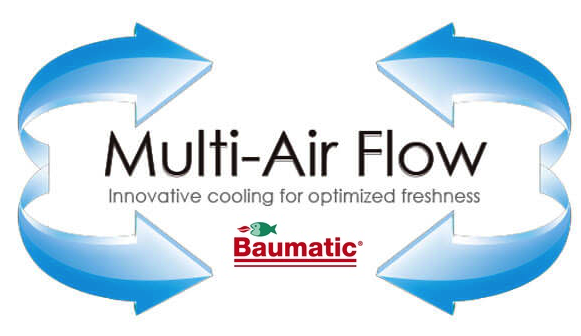 A key performance feature with Baumatic’s refrigeration range is our Multi Air Flow System. Cool air flows constantly from various points within the fridge to ensure every corner remains at the preselected temperature consistently. 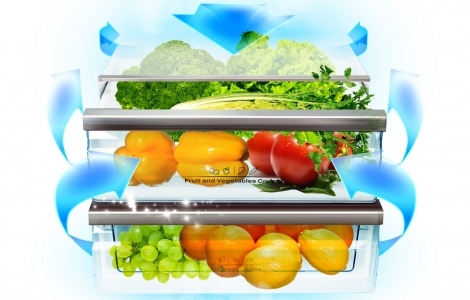 The result is your food stays fresher for longer with Baumatic’s Multi Air Flow System. Baumatic’s fridges use leading inverter compressor technology. When combined with our digital temperature control and display, you get a very precise temperature management system. 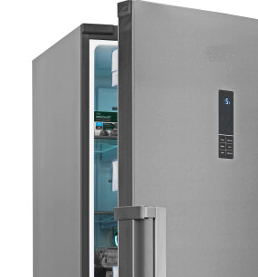 The fridge operates independently from the freezer, ensuring no unnecessary energy use and maintains your preset temperature at all times. Whatever your kitchen design or family size, Baumatic’s refrigeration collection gives you the flexibility to integrate the most suitable model for you. 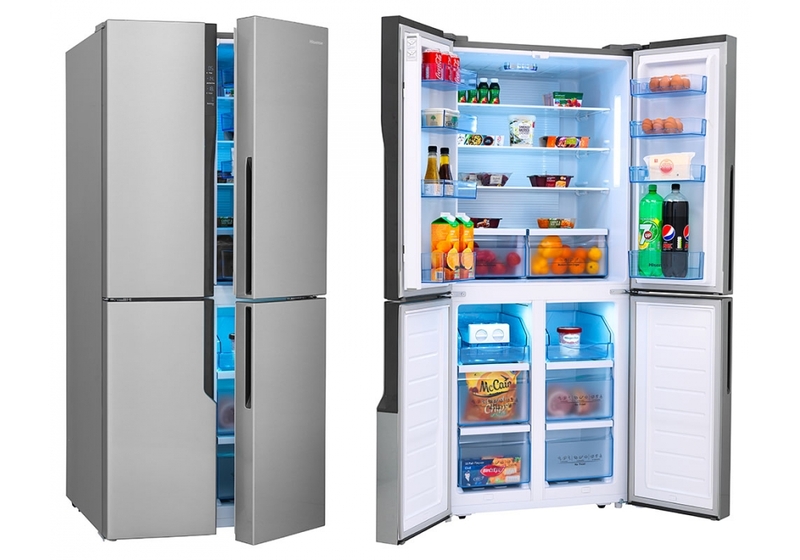 We have a range of freestanding models in side by side or a 4 door model for those requiring an extra wide fridge. There are also more traditional top mount fridge freezers in large capacities and a range of built in models should you wish to integrate and completely conceal your fridge freezer. 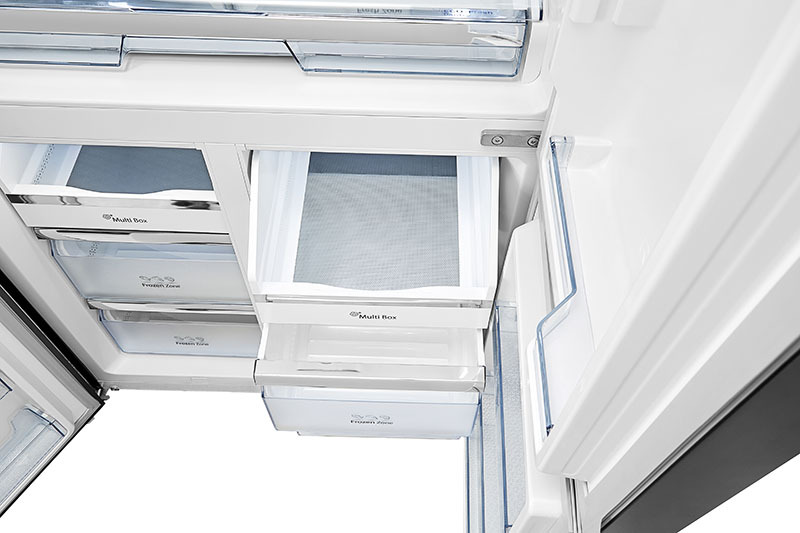 Because not every family is the same, our fridges offer you a flexible choice of storage compartments. Whether storing more fresh fruit and vegetables, dairy and seafood or freezing, Baumatic offers you large choice of storage options. 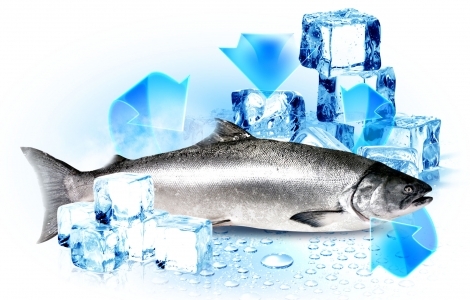 A fresh compartment’ stores dairy and seafood at a zero temperature that extends the life of the food. There are various extra large door buckets, fruit and vegetable crispers and tilting baskets in some models. A freeze compartment with a temperature range setting from -7 to -18 deg C, gives you total control and flexibility. 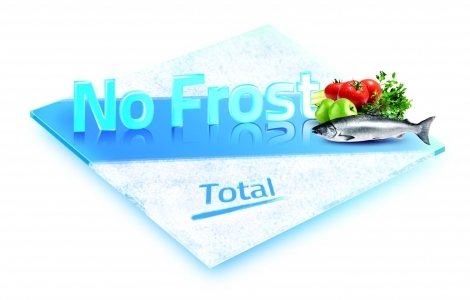 Thanks to innovative Total No Frost technology, ice crystals are unable to form, ensuring there is no build up of frost and ice in the fridge or the freezer. This means that you will never have to defrost again saving you both time and money. When stocking your fridge and freezer with new groceries, using the Fast Cool or Fast Freeze functions quickly returns your food to the correct storage temperatures. This feature is ideal for groceries that have travelled in warmer temperatures from the supermarket to your home. 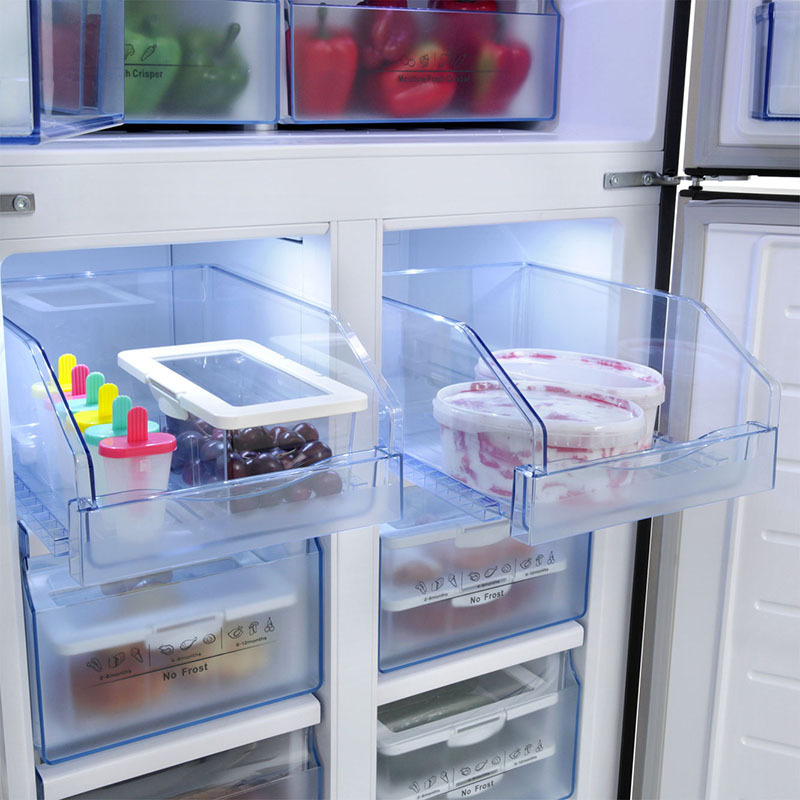 Baumatic fridges are always keeping your food fresher for longer. 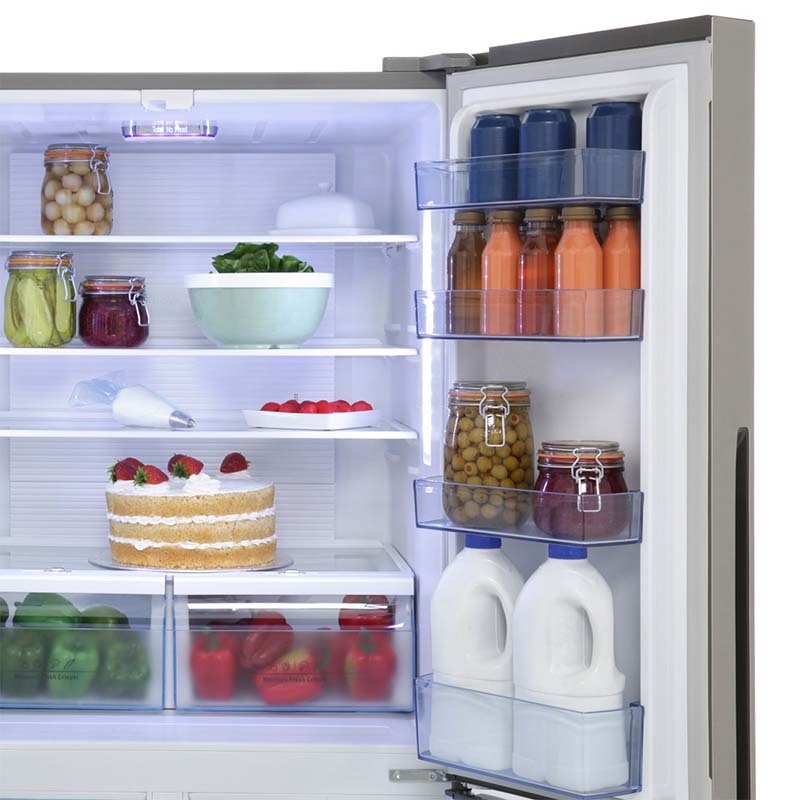 Our fridges use low voltage LED lighting for optimum, bright illumination. Resulting in seeing more of your fridge’s contents in the most efficient way. Our Baumatic fridges feature tempered glass shelving. Easy to wipe clean and durable enough for every day use, some models also have a spill safe feature. 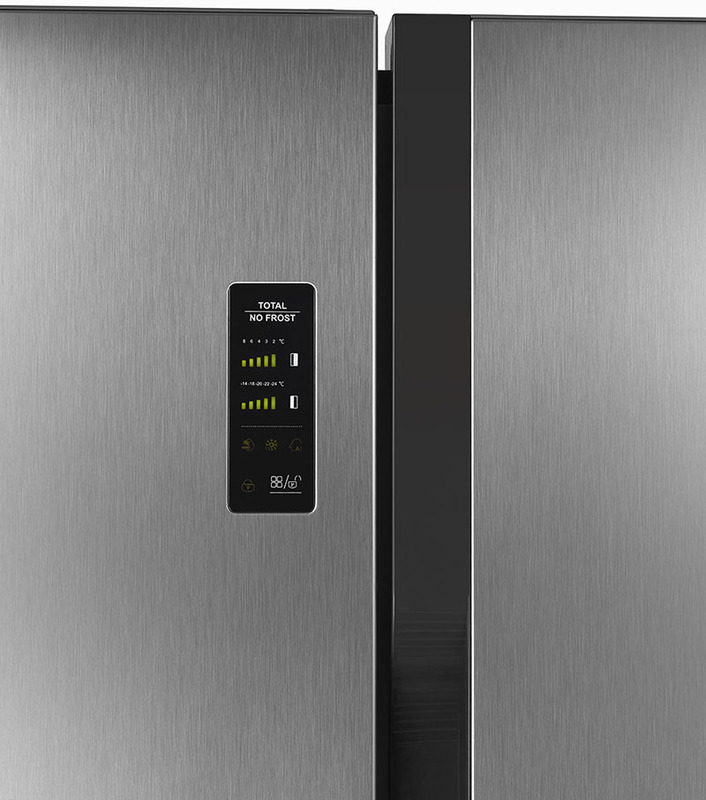 Baumatic’s product designers have used the latest in fridge finish technology for our freestanding fridge range. The result is a stunning stainless steel look silver finish that’s durable and easier to maintain then traditional stainless steel. Our silver finish is mark free, wipes clean with a cloth and will maintain a bright as new appearance for years to come. 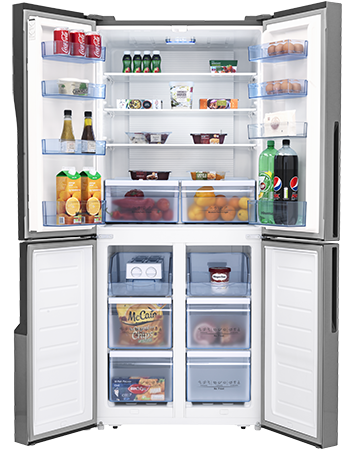 We know it is imperative to have a fridge and freezer that stores your food so that it remains fresh and lasts as long as possible. This helps reduce your food bills. 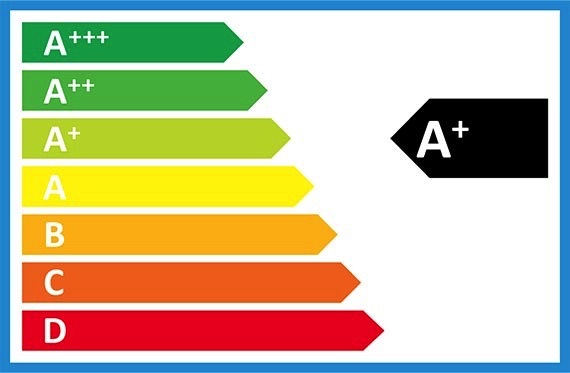 Baumatic fridge freezers also help reduce your energy bills by giving you optimum performance at up to A+ energy ratings.